In this page area bounded by twoparabolas we are going to see how to find area between two parabolas. 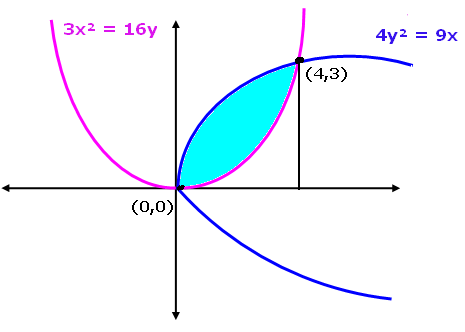 To find area enclosed by two curves we need to draw the rough diagram for the curves and we need find the point of intersection of those curves. First we need to draw the rough sketch of two parabolas to find the point of intersection. Let us see the first equation which is 4y² = 9x. From this equation we come to know that the given parabola is symmetric about x axis and open rightward and vertex of this parabola is (0,0) . Now let us see the second equation which is 3x² = 16y. From this equation we come to know that the given parabola is symmetric about y axis and open upward and vertex of this parabola is (0,0) . Substitute the value of y in the equation y² = 9x/4. Therefore the two parabolas are intersecting at the point (0,0) and (4,3). In these type of problems, graph is very important to find out the limits. Without the graph to determine which function is the upper one and which one is the lower one, is difficult. Area between two curves is always positive. If we get negative answer then we will come to know that we had done some mistake and we can correct it. Students can go through the problem, and try to solve it on their own, in the same way we had discussed above. If you are having any doubt you can contact us through mail, we will help you to clear your doubts.